Mitral regurgitation is associated with cardiac malformation and can occur at any age, both in adults and in children. Depending on the course, a milder or more severe symptomatology is indicated. In the latter case, surgical intervention is mandatory, which helps to improve the quality of life of the patient. Mitral regurgitation (MR) is the most common type of heart valve disorder. Some people with MP do not make complaints and can be in stable condition for many years or even throughout their life. However, in other patients, MP eventually causes cardiac decompensation and leads to heart failure. In such cases, the developed complication may be irreversible. 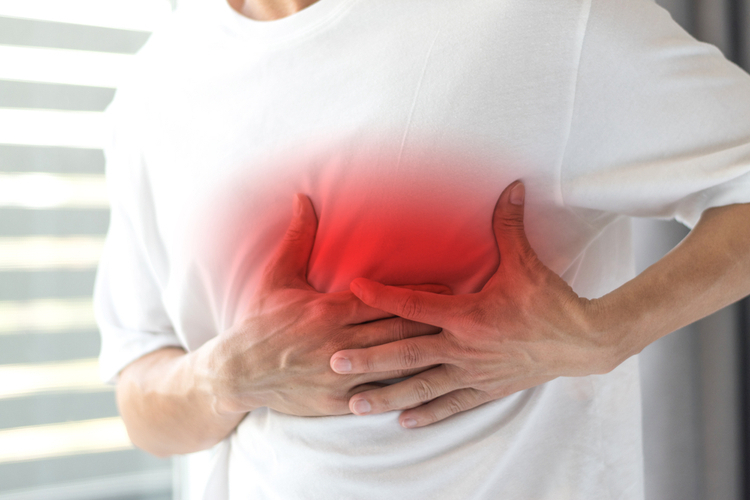 Previously, mitral regurgitation was mainly the result of rheumatic fever, whose popularity has now declined as a result of more thorough and consistent treatment of bacterial infections. In developed countries, MR occurs most often against ischemic heart disease, cardiomyopathy and mitral valve prolapse syndrome. In addition, mitral regurgitation can be a congenital heart defect or occur in combination with other congenital heart defects or congenital disorders of connective tissue. In 8.6% of clinically healthy Turkish children aged 0-18 years, mitral regurgitation was determined by echocardiography [1 - C. Ayabakan et al . : The Doppler echocardiographic evaluation of valvular regurgitation in normal children. In: Turk J Pediatr. (2003); 45, S. 102-107.]. Among children with rheumatic heart disease living in developing countries, mitral regurgitation is the most common heart damage [2 - KC Bahadur et al . : Prevalence of rheumatic and congenital heart disease in schoolchildren of the Kathmandu valley in Nepal. In: Indian Heart J. 2003 Nov-Dec; 55 (6); S. 615-618]. A prospective study in the UK showed a prevalence of 1.82% in children and adolescents aged 3-18 years. None of the sick children was less than 7 years old. 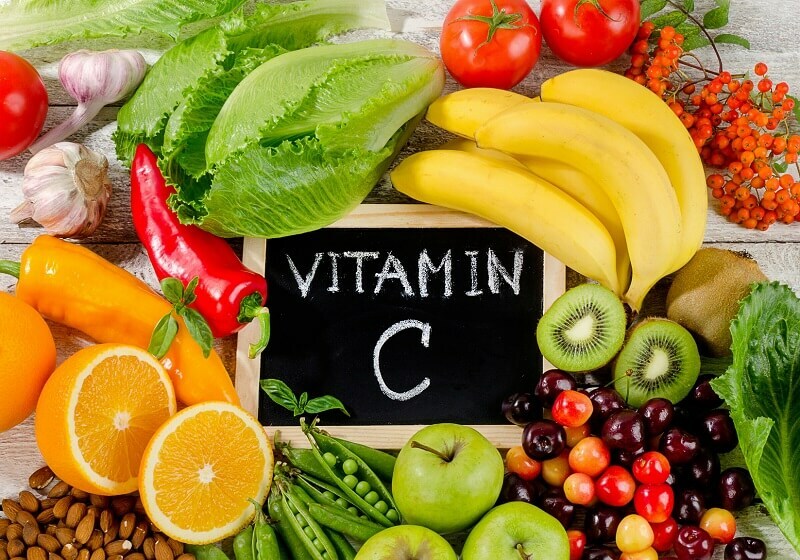 Other studies in the US found a prevalence of 2.4% among healthy children and adolescents aged 0-14 years. Almost a fifth of the 33,589 people studied in the Framingham study had mitral regurgitation. There were no gender differences: in 19% of men and 19.1% of women, echocardiography revealed at least a weakness of the mitral valve. In 11-59% of all patients after a heart attack, mitral regurgitation was identified in several studies. After 31% of operations performed on the heart valve in Germany, mitral regurgitation is the second most frequently managed heart defect. The mitral valve is located between the left atrium and the left ventricle of the heart. It opens in the phase of filling the ventricle (diastole) and, thus, allows the blood flow to go from the atrium. At the beginning of the ejection phase (systole), a sharp increase in pressure in the ventricle leads to the closure of the valves and, consequently, to the separation of the atrium, in which a pressure of about 8 mm Hg is established. Art. (11 mbar), whereas in the ventricle the systolic pressure is about 120 mm Hg. (160 mbar), which under normal conditions sends blood to the main artery (aorta). In the acute stage with the normal size of the left ventricle and the left atrium, there is a significant increase in pressure in the atrium and, consequently, in the pulmonary veins, sometimes up to 100 mm Hg. (130 mbar), which causes immediate pulmonary edema. In addition, the prevailing back then blood flow can lead to poor discharge into the aorta and, consequently, to a lack of blood flow throughout the body. If the acute stage is over or mitral regurgitation develops over a long period of time, adaptation (mechanisms of compensation) of the heart and pulmonary vessels becomes chronic. Acute severe mitral regurgitation as a complication of myocardial infarction or inflammation of the heart valve is a rare but usually unfavorable condition requiring intensive treatment and often prompt correction of the affected leaf. In the compensated MR, the cardiovascular system is able to correct the additional volumetric load imposed on the left ventricle due to valve damage. The heart compensates for the defect by increasing the mass of the heart muscle, so it manages to function normally.People with a compensated MR usually do not make any complaints, although their load capacities are relatively reduced, especially against the background of a stress test. Many patients with moderate chronic MR remain at the compensated stage throughout their life. For reasons that are not fully understood, some people with MP gradually "move" from the compensated stage to the decompensated state. Ideally, the valve repair operation should be performed in this transitional stage, when the risk of the operation is relatively small, and the results are relatively good. During the transitional stage, the heart begins to increase, the pressure in its cavities also increases, while the ejection fraction decreases. At this stage, Patients are more likely to report shortness of breath and poor physical tolerance, many do not notice worsening the general condition of the symptoms until their MP reaches the third stage. Such a problem leads to the postponement of the operation until the decompensated stage does not cause an extremely serious state of health. Patients with a decompensated stage of MP almost invariably have a significantly enlarged heart, as well as severe symptoms of heart failure (dyspnea, edema, arrhythmias). In severe MR, the regurgitation orifice is more than 40 mm2, and the volume of regurgitation is more than 60 ml, which can lead to serious and sometimes life-threatening changes, especially at a low heart rate, reduced contractility and a large peripheral and pulmonary vascular resistance. 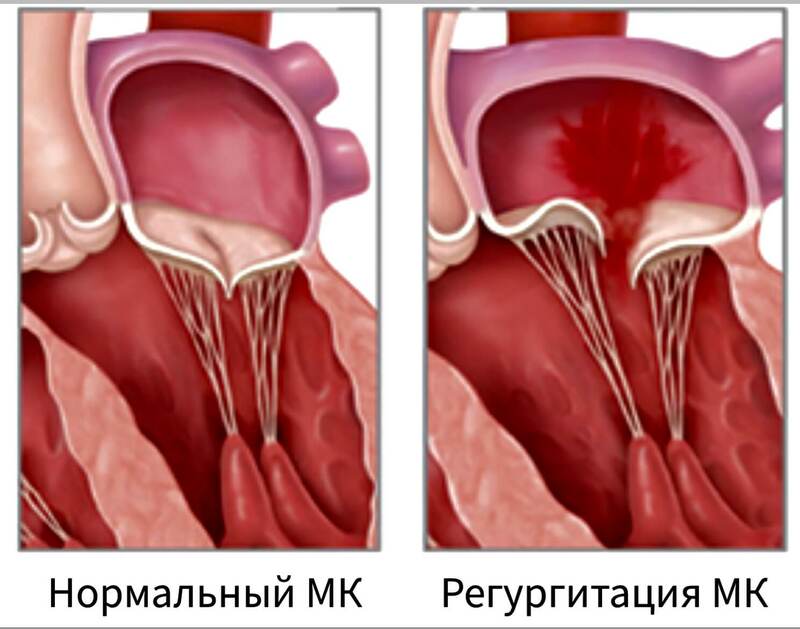 After the decompensated stage developed, which arose against the background of this cardiomyopathy (damage to the heart muscle) is present and will remain even after the restoration of the mitral valve. Therefore, the operation to reconstruct the affected leaflets becomes quite risky and is unlikely to lead to the desired result. In addition to the stages of development of mitral regurgitation, the degree of severity of pathology is distinguished, which helps in better selection of the patient's treatment strategy. The first degree - the volume of returned blood from the left ventricle to the left atrium is no more than 25%. Clinically, the pathology of the first degree is not expressed in any way, there are also no significant changes on the ECG, therefore, Doppler ultrasound is most often used to determine the first degree of MP. The second degree - the volume of the return return of blood can reach 50%. This contributes to the development of pulmonary hypertension. In some cases there is a secondary change in the myocardium. The ECG shows signs of widening the boundaries of the heart. The third degree is accompanied by a reverse blood flow with a volume of up to 90%. In addition to pronounced clinical signs on the ECG, hypertrophy of the left ventricle is clearly visible. Fourth degree - the disease passes into a critical condition, when the patient can have serious complications in the absence of surgery, including cardiac arrest. The most common cause of MR in developing countries is mitral valve prolapse (PMC), which is also the most common cause of primary mitral regurgitation in the United States, causing about 50% of the incidence. It is more common in women, as well as in people of age, which leads to stretching valve flaps and chordinal tendons.This elongation prevents the valve flaps from closing completely, so when the valve closes, its valves fall into the left atrium, which contributes to the development of the MP. Causes MR by combining ischemic dysfunction of papillary muscles and dilatation of the left ventricle. This can lead to a subsequent displacement of the papillary muscles and an expansion of the annular opening of the mitral valve. The spread of the disease in most countries is stopped, but in developing countries, even in the context of this inflammatory-infectious disease, MR develops quite often. Secondary mitral regurgitation is caused by dilatation of the left ventricle, which causes a stretching of the annular space of the mitral valve and displacement of papillary muscles. This expansion of the left ventricle can be caused by any cause of dilated cardiomyopathy, including aortic insufficiency, non-ischemic dilated cardiomyopathy. Since under such conditions papillary muscles, chords and valve valves usually function normally, this condition is also called functional mitral insufficiency. Acute MI is most often caused by endocarditis, mainly S. aureus. Rupture or dysfunction of the papillary muscle is also a common cause in acute cases of dysfunction, which can include mitral valve prolapse. 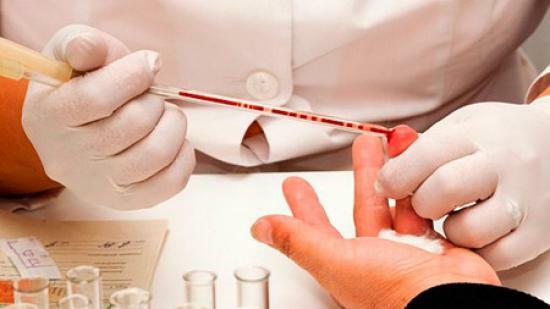 There are many diagnostic tests that can determine the presence of MR. These tests involve the diagnosis of pathology and can tell the doctor which further testing is most appropriate. In particular, imaging studies, such as echocardiography or magnetic resonance angiography of the heart, are used, and electrocardiography is used to evaluate the state of cardiac conduction. In chronic MR it is characterized by an increase in the left atrium and left ventricle. Medicinal vascular markings are usually normal, as pulmonary venous pressure, as a rule, does not significantly increase. A transesophageal echocardiogram is usually used to confirm the diagnosis of MR. A color Doppler flow on a transthoracic echocardiogram (TTE) reveals a blood stream flowing from the left ventricle to the left atrium during ventricular systole. In addition, the method can detect an enlarged left atrium and ventricle and a reduced function of the left ventricle. Because of the impossibility of obtaining accurate images of the left atrium and pulmonary veins with the use of a transthoracic echocardiogram, in some cases a transesophageal echocardiogram may be required to determine the severity of the MP. An electrocardiogram with a long-term MR may indicate an expansion of the left atrium and hypertrophy of the left ventricle. Atrial fibrillation can also be noted on the ECG in individuals with chronic mitral regurgitation. The ECG sometimes does not show any of these results when staging an acute MR. Treatment of mitral regurgitation depends on the severity of the disease and the presence of concomitant signs of hemodynamic disorders. In acute MR, secondary to the mechanical defect of the heart (i.e. with a rupture of the papillary muscle or the chord of the tendon), the treatment of choice is surgery on the mitral valve. If the patient has hypotension before the surgery, a balloon pump can be placed inside the aorta to improve organ perfusion and reduce the degree of MP. At normal pressure, patients with MR can be prescribed vasodilators, which can reduce the load on the left ventricle, and thereby reduce the severity of regurgitation. The most commonly used vasodilator is nitroprusside. Patients with chronic MR are prescribed vasodilators, as well as drugs that reduce stress. On the heart. In the chronic condition, the most commonly used agents are ACE inhibitors and hydralazine. Studies have shown that these funds postpone surgical treatment of mitral insufficiency. However, at present, guidelines for treatment of MP limit the use of vasodilators in people with hypertension. 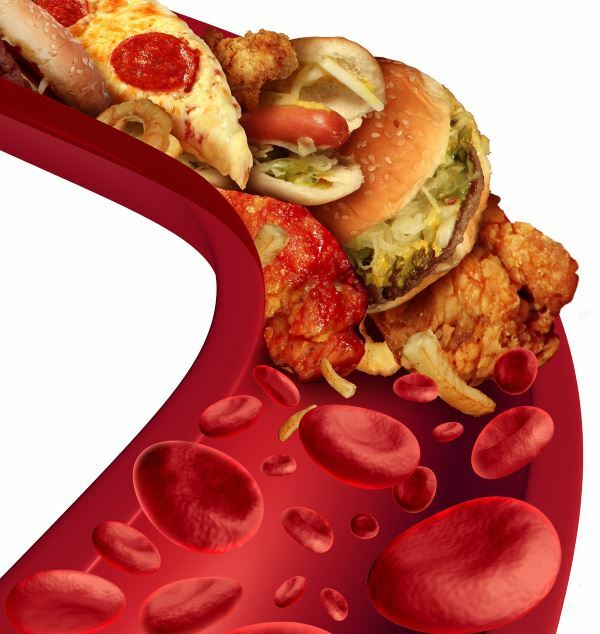 Any high blood pressure is treated with diuretics, a diet low in sodium. As with hypertensive and normotensive options, digoxin and antiarrhythmics are used. In addition, with concomitant prolapse of the mitral valve or atrial fibrillation, anticoagulants are given. In general, drug therapy is not very effective and is used to improve the conditions of patients with moderate mitral regurgitation or in the case of patients' inability to undergo surgery. Surgical intervention is a cardinal remedy to eliminate regurgitation of the mitral valve. Restoration of the mitral valve. 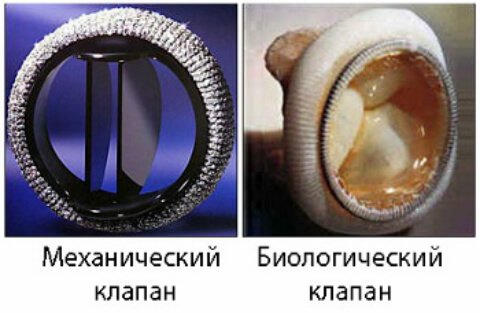 Repair of the mitral valve is preferable to replacement, since replacement valves for the bioprosthesis have a limited lifespan of 10 to 15 years, whereas synthetic replacement valves require the continuous use of diluents to reduce the risk of stroke or heart attack. There are two general categories of mitral valve repair approaches: resection of the valve segment (sometimes referred to as the "Carpentier" approach) and the installation of artificial chords to "anchor" the dropping segment of the papillary muscle (sometimes referred to as the David approach). When performing resection, any prolapsic tissue is removed. In general, the operation on the mitral valve is performed on the "open heart", when the heart stops, and the patient connects to the cardiopulmonary device. This allows for a complex operation on a stationary organ. Because of the physiological stress associated with open-heart surgery, elderly and very sick patients may be at increased risk, so they are not candidates for this type of surgery. As a result, attempts are being made to use technologies that allow working on a working heart. For example, the Alfieri method is replicated using a percutaneous catheter method that installs the "MitraClip" device to close the affected mitral valve site.